What's with the nails featuring bugs!! I dunno, but for the third day in a row I've got some bugs on my nails. And for the second day in a row I don't think my bee design is going to be very unique. I've just painted my green nails for tomorrow, and I nearly went with a beetle design, but I figured it's time to move to a new theme. Poor yellow polishes, they don't get too much love from people. I've actually built a nice little range of yellow polishes now, but I tend to always go to the same ones. One of my go to's is Ulta3 Honolulu. It's a good yellow creme that is opaque enough at two coats, not streaky and dries quickly. After painting my yellow base, I stamped with the honey comb design from DRK-A plate using Jade Mystic Gold. The stamping is subtle and sparkly and shows just enough to know its there. 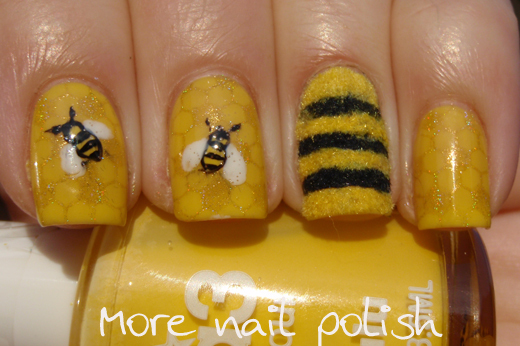 I then painted my little bees free hand (after which I remembered why I don't normally attempt freehand nail art). On my ring finger, I created a fuzzy bumblebee. I painted black lines and applied black flocking powder, and then painted yellow in between the black and applied yellow flocking powder. This was the first time I've used flocking and while my efforts here aren't that good, I still like it - I like the feel and the appearance. I will use flocking powder more I think. Once again, here is proof I did a full mani. The bees on my right hand were quite hilarious! I love this! 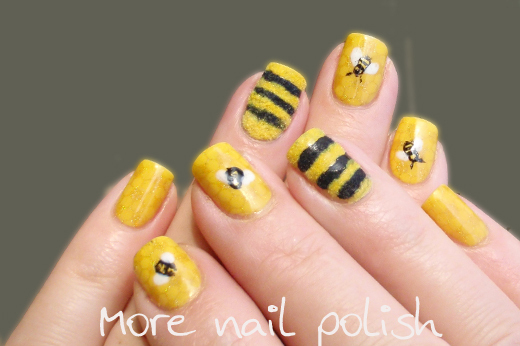 I also did bees but they're so much less realistic than yours lol. That honeycomb stamp in gold is fantastic! 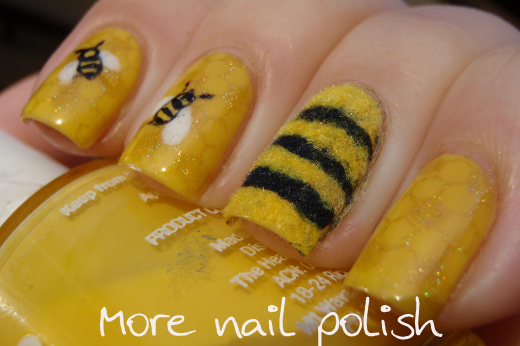 Wow, love the bees and the fuzzy nail! Your hand painted bees are fantastic, I thought they were decals! Awesome mani! I did bees, too! 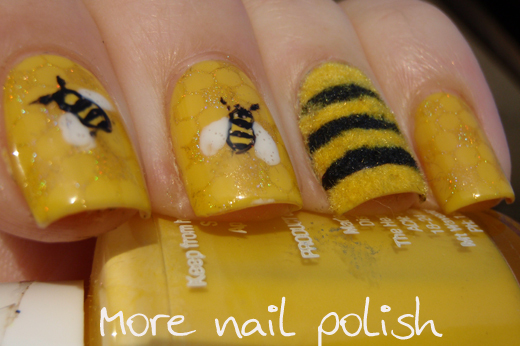 I LOVE the subtle stamping and the fuzzy bee nail is so cute I just want to huggle it! I love the fuzzy nail, so adorable! Everything about these nails is just awesome! Lovely! Ohhh this is so nice! For some reason I didn't think of bees! 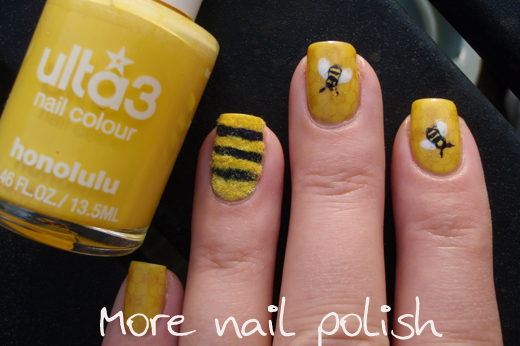 Love love love the fuzzy bumble bee! Genius! This is gorgeous! I love the subtle honeycomb look - it almost looks like a jelly sandwich! LOVE these! what plate is the honeycomb stamp from?